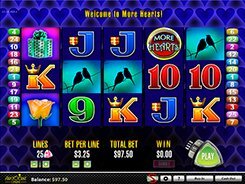 More Hearts is a 5-reel 25-payline video slot released by Aristocrat and themed around romance and the things that many people like: hearts, butterflies, birds, gift boxes, etc. As many other games by this developer, More Hearts features a +5 Lines option enabling you to activate 25 regular paylines plus 5 extra paylines that would increase a theoretical RTP and unlock more features. A bet ranges from $0.5 to $125 per spin. The slot has a wild depicted by the Diamond that substitutes for other symbols and pays out the grand prize worth 2000 coins if five wilds land on an active payline. The Heart is a scatter, with these 3 or more triggering an amazing bonus feature with 15 free spins. After the free spins start, the screen will split into two reel sets that run simultaneously. Every Heart symbol that lands on the reels will be added to the Heart Meter, and once 9 hearts are collected, the third set of reels appears on the screen. If you accumulate 14 hearts until the end of the free game, you will play four sets of reels at a time! PLAY FOR REAL MONEY!